Do you ever feel like things are just moving too fast? Like you just can’t keep up the pace? Does your “To Do” list overwhelm you? We all have legitimate things that keep our bodies and minds on the go. I have been in that mode lately. Add to it the crazy things happening in our world lately and it’s enough to make anyone go into hiding. I handle it, until I just can’t anymore. And that’s what has happened. In a rare moment of quiet (at yoga class, which has been a challenge to get to lately) I realized the frantic pace I have been maintaining. It took the merry-go-round stopping for me to really understand how severe my situation gets at times. I set my intention for the class. I decided to commit to slowing down. I focused on my breath. Simple. Slow. By the end of the class my teacher reminded us of the intention we set for ourselves at the beginning of the hour. She urged us to try to carry that with us into the world for as long as we could. So that is what I decided to do. I am slowing down. This isn’t some silly lark juice fast here, but rather a serious necessity. If I don’t slow down I will hit a wall. And that can’t be good for me or my family. This is not an easy thing for me to do. My usual mode has me spinning several plates at a time while I plan my next 20 projects. When I get over done….you can just imagine the hyper speed I am functioning at. Or failing to function at, which is what brings about a crash. So, anyway, the strategy is small simple steps for me. Breathing. Taking my time. Doing one thing at a time (very challenging for this type A mommy). Enjoying the moment (especially with O and my husband). And remembering that there are things that I like to partake in, not because they have to get done, but because I enjoy doing them. So I am making jam. Raspberry jam from our garden. You might laugh and think how ridiculous. Go ahead. I’ve made several pies already, but the jam is my favorite. It is something to savor into the autumn and winter. It is a gift to give neighbors and friends. And for me, this summer, it signifies my struggle to slow down. I realized the other day that summer is half over and I don’t feel like it even started yet. What kind of deluded fog have I been in? To say my husband and I have a lot our plates is an understatement. But it is all the more reason to slow down when we are faced with challenges. It’s things like working in the garden. Or listening to the rain hit the skylight. It’s sitting on the kitchen floor reading to O in the middle of making dinner. It’s the smell of our babies hair and the warmth of his breath when he cuddles next to us. It’s looking into my Love’s eyes after a long day and really seeing him. It’s letting him know without words that he is loved and safe in our relationship. All these things require slowing down. They take time and connection. Without these moments of meaning, our lives are just moments that are unacknowledged. A kind of going through the motions. It’s funny…the older I get the clearer it becomes to me. The moments in my life that speak out to me as defining and full of passion and truth, are the simplest ones. I have a vivid simple memory from years ago that I look at now and know it was a defining moment. It was years before my husband and I got married. We were visiting as friends, and I remember him driving me in his jeep. We were listening to music, just driving to nowhere, and he put his hand in mine. I remember looking down and seeing our hands together and knowing that it felt so right. I knew then, it was right. So much in that simple quiet moment. Life is funny like that. 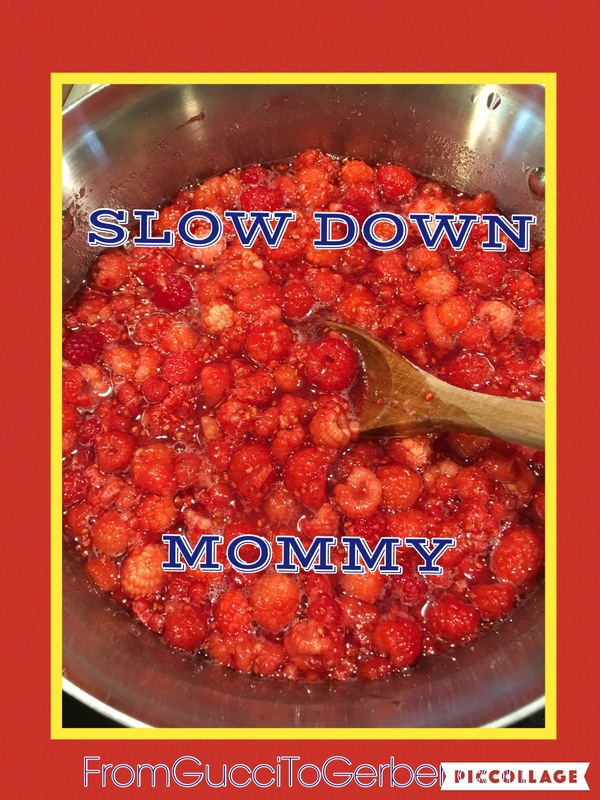 So….slow it is. For as long as I can do it. Who knows, maybe it will become habit for me. A way of life, even? And if I fall off the wagon, well then I’ll just have to get back up on the slow ride. Cause it’s not just me anymore. I have a husband and child who need me there. Fully present. Fully focused. And happy. Oh yes, happy. Covered in raspberry jam happy. This entry was posted in Wise Words? 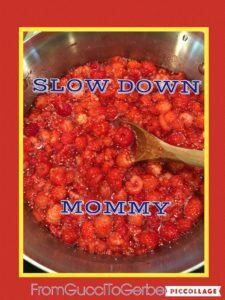 and tagged advanced maternal age, husband, mommy, mommy blog, parenthood, parentiing, quiet moments, raspberry jam, slowing down, Summer, toddler.